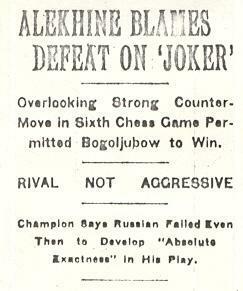 During the first part of his world championship match against Bogoljubow in 1929 Alekhine contributed seven articles on the contest to the New York Times. The full texts are given below, and it will be seen that they featured a number of rough edges, in terms of language and in the recording of chess moves. The articles ended after the first eight games, which were all played in Wiesbaden, Germany. ‘WIESBADEN, Sept. 7. – Setting aside for the moment consideration of the personality of both combatants and the outcome of their meeting, the match for the world’s chess championship, which opened here yesterday, unquestionably constitutes a significant stage in the postwar development of European chess activities. For the first time in 20 years – the match between Dr Emanuel Lasker and [Carl] Schlechter was fought in Vienna and Berlin in 1910 – European chess circles have organized a world championship match on European soil. The last two contests for the world’s title, each of which determined a new holder, were decided in Latin America – Havana and Buenos Aires. 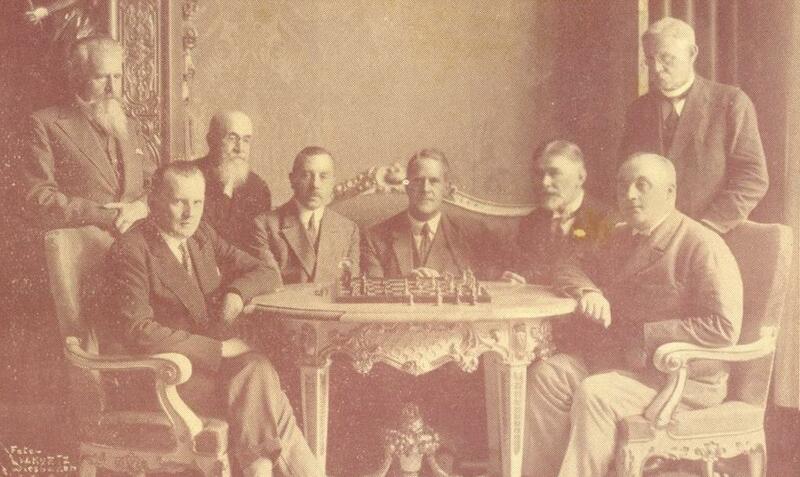 They contributed to promoting interest in chess in both continents, although Europeans were not given an opportunity to exploit the qualitative outcome of these matches in an equal degree. As regards the match in Havana, Dr Lasker, unable to concede José R. Capablanca of Cuba the handicap of climatic conditions which affected him unfavorably, as well as the discrepancy of 20 years in their respective ages, preferred to renounce his title at a point in the match when ten games were yet to be played rather than risk his health in hospitable albeit treacherous Havana. As a result, European interest in the quality of this match was considerably lessened. This also in a measure was the case with my match against Capablanca in Buenos Aires in 1927, because the scores of the games reached Europe with considerable delay and were inadequately commented. In addition thereto, the numerous draws affected the public’s sporting interest in the match. The games were only superficially examined, and consequently, but unjustly, underestimated, because in both cases most of the drawn games also reflected strenuous headwork and sturdy battles. It must not be forgotten that in a match this question of draws takes on an entirely different aspect than in tournament play. In the face of heavy competition in tournaments it becomes necessary, even when pitted against a strong player, to plan one’s game with the idea of forcing a victory even at the risk of losing. This was well and often illustrated in Nimzowitsch’s play in Carlsbad. In championship match play, however, under conditions as they have prevailed up to the present, one must chiefly avoid defeat because three drawn games are less harmful than one losing point. Admitting that games in match play generally seem more monotonous to the public, their scientific importance is greater than that of tournament games. Because of their frequent repetitions, the various openings are subjected to practical exploration even down to minutest details, and this process is objectively carried on until a definite and unimpeachable verdict is reached. This can be attested to historically. In the world’s championship matches between Steinitz and Chigorin, the Evans’ Gambit and Two Knights’ Opening were subjected to thorough illumination; Dr Lasker and Dr Tarrasch explored the Rio de Janeiro variation of the Ruy López opening, while Alekhine and Capablanca tackled several important variations of the Queen’s Gambit. The match now under way unquestionably also will contribute essentially to amplifying research into the theory of chess, for my opponent rightly ranks as one of the most successful of the modern theorists. His latest publication, The Modern Opening, Pawn to Queen’s 4, won deserved recognition and was not without influence on the treatment of the openings in the recent Carlsbad tournament. Despite numerous prospective draws, the match now begun should supply some lively play – much more so than the two previous matches for the title. This is vouchsafed in the strong chess individuality of Bogoljubow, his unrestrained temperament and his fiery optimism. Swept on by these characteristic elements in his make-up, Bogoljubow often plunges into almost foolhardy experiments involving the worst sort of dangers, from which he then succeeds in escaping after the fashion of a somnambulist. It is assumed that in the course of the present match he, as challenger, will feel himself morally compelled to adopt violent measures, but in this case he must reckon with a correspondingly aggressive resistance. If the impending games equal our previous tournament games so far as suspense and thrilling play are concerned, the chess circles which were the inspiration of this match will be more than rewarded. In connection with such a match where much is at stake for both players, interested onlookers most naturally will carefully scrutinize the fighting methods of both combatants in an effort to discover whose method gives the greater promise of success. Experts generally have designated Bogoljubow as a great chess romanticist, and he is the richer of the two players in imagination. I, on the other hand, have been given credit for a more exact execution of tactical ideas. But despite this, and quite rightly so, no great difference in our respective style of play has been recorded. I may be permitted to observe the following in this connection: Bogoljubow is four years older than I, but he first entered the international chess arena in 1914, whereas I already had participated in the Hamburg masters’ tournament of 1910. In respect to his interpretation of chess, since the beginning of his career, I have comprehended his fighting individuality better than that of any other master. And yet, Bogoljubow claims that my style of play influenced his chess development for a long period. Granted our interpretation of the essence of chess bears certain resemblances, our conception of life and our attitude toward combat are fundamentally different. So far as I have observed him, Bogoljubow, propelled by his unlimited optimism, constantly hopes to discover new forces in the reservoir of his talents for his creative purposes; he views his opponent as a welcome experimental field for the application of his art, and he does not consider it especially essential to make his closer acquaintance. Such an interpretation may be impressive, but only to the point where it is coupled with external success, for it supplies the combatant with an illusion that suggests he is capable of attempting miracles; but woe unto him if, through some secondary circumstance, failure sets in. Then a supreme faith in one’s self cannot replace a real knowledge of things. In his subjectivity he scarcely will be able to find the right explanation for such an incident, and he then will lose his self-confidence, which to him is of the greatest importance. In Bogoljubow’s case the danger of such negative results of an exaggerated optimism are ameliorated through the intervention of a peculiar psychological quality. Strange to relate, he combines with his Ukrainian sluggishness and incidental stubbornness in pursuit of his aims an industry and zeal for scientific chess which may be due to his extended sojourn in Germany. Now, my conception of the fighting aspects of chess, from the very beginning, has been of the opposite nature. I have considered three fundamental prerequisites as absolutely essential to success: Firstly, self-knowledge; secondly, a firm comprehension of my opponent’s strength and weakness; thirdly, a higher aim – one that transcends momentary self-satisfaction. This aim I envisage in artistic and scientific accomplishments which accord our chess equal rank with other arts. Now, will these differences in character be decisive for the outcome of this match, or will unexpected circumstances, such as physical exhaustion of lack or endurance, decide the issue? At any rate, the resisting powers and nerves of both combatants are confronted with a severe test, for the match presumably will continue for 2½ months. For the start eight games will be played here, after which the players will recess for one week, during which I shall attend the congress of the World Chess League [sic] in Venice as a delegate for France. The next three games will be played in Heidelberg, then six in Berlin, the same number in Holland if the match still is undecided and the final encounters again will be played here. ‘WIESBADEN, Sept. 7 – The first game in the match for the world chess championship was exciting and from the viewpoint of theory it also was notable despite the fact it was a comparatively brief contest. Bogoljubow, who had the black pieces, adopted the so-called Russian Defense in answer to the Queen’s Gambit. Among other things, this variation has the purpose of accepting the proffered pawn after due preparation and then abandoning it later in a favorable position after time for the full development of the pieces has been gained. This procedure was especially carefully analyzed by Bogoljubow in his last volume and he adopted this style of play in his match with Dr Euwe. However, he deviated from the customary continuation at his fifth move by dispensing with the development of his queen’s bishop, whereby he confronted me with a dilemma. I had to decide forthwith whether by advancing my king’s pawn one square I could also acquire a variation of the Queen’s Gambit or whether, by moving it two squares, I could afford to offer a regular gambit. After due deliberation I selected the latter alternative, which leads to positions which have not yet been fully explored. After only a few moves it became apparent that the sacrifice of the pawn was more than offset by the offensive advantage obtained. Indeed, I succeeded in organizing an attack similar to that I had obtained in a consultation game played last Spring in the Manhattan Chess Club in New York. The menace in the centre of the board and on the queen’s wing became so acute that Bogoljubow, at his 13th move, had to renounce castling, incidentally exchanging his only fully developed piece. Had he instead moved his queen’s rook, as the spectators expected he would, then my queen’s bishop would have effectively penetrated into the game with a gain of time. His game very soon became hopeless due to the weakness of the black squares and his inability to promptly mobilize his queen’s wing. Threatened with the positive loss of a rook he was forced to resign after 26 moves. ‘WIESBADEN, Sept. 14 – After the second and third games of my match with E.D. Bogoljubow had terminated in draws after lively encounters, the fourth game again brought a decision and that in favor of the challenger for my title, who thereby evened the score. In this game, as in the second of the series, I used the modern Nimzowitsch variation of defense, but adopted on the sixth [sic] move a different development for my queen’s knight, which logically brought an exchange of king’s bishops [sic], leaving my opponent the advantage of his two bishops. For a time it appeared that the player of the white pieces could not make permanent use of this advantage as he was engaged in mobilizing his king’s wing and at the same time meeting the black’s [sic] attempt to breakthrough in the middle of the board. Bogoljubow, however, played in top form and with accurate work he succeeded, on his 16th move, in establishing a position which permitted him to castle with safety on the king’s side by exchanging his queen’s bishop for my knight and subsequently, through advancing his pawn to king’s five, to maintain constant pressure on the queen’s file. He selected, however, a more active continuation on his 17th move, which threatened to expose him to danger on his king’s wing. This menace became still more acute when he accepted my sacrifice of a pawn on the 21st move, and it is doubtful whether he could have withstood my attack if, for instance, on my 22nd move I had played knight to queen’s knight three. Instead, I committed a fundamental oversight in this promising position which cost me two pawns, Bogoljubow attending to the rest of the game in keeping with the accepted procedure. The challenger was squarely entitled to win this game. My chief error consisted in adopting a less favorable opening variation and one which I rarely play. The result was a protracted study of position in the opening stages at a cost of time, followed by a grave error in a perfectly tenable position. The second, third and fourth games of the match, as a matter of fact, demonstrated that Bogoljubow’s strength as compared, for instance, to that of José R. Capablanca, is to be found in the manner in which he builds up his game, whereas in judging the endgame prospects, he is decidedly not the equal of the Cuban master. ‘WIESBADEN, Sept. 15 – After having suffered defeat in the fourth game of my match with E.D. Bogoljubow, it was, of course, highly important that the fifth game should not terminate similarly, for while the loss of a single game can be ascribed by the victim more or less to circumstances, two successive defeats are likely to have a detrimental psychological effect in that a player may lose his self-confidence, a circumstance which might have a decisive bearing on the final outcome of the world’s match. Despite these considerations, I decided to adopt, in the fifth game’s opening, the same active variation of the accepted Queen’s Gambit that I had played in the third game in preference to choosing some placid opening which insured a draw. In this I was not influenced by the fact that the third game was won for me on the 53rd move through the king taking the knight’s pawn instead of bishop to rook five, but I wanted to effect a reinforcement in position which would allow the black to obtain a simplification of position under highly unfavorable circumstances. This departure bishop to knight five on the seventh move netted me an advantage in so far as my opponent, in the belief that he had safely negotiated the hidden reefs in the opening stages and arrived at an exchange of queens on the 16th move, found himself confronted by a difficult endgame problem in that he not only had to find a way of releasing his queen’s bishop, whose isolation was the immediate purpose of my opening variation, but he was also compelled to find usable squares for his knight. As matters went, Bogoljubow succeeded in solving the problem fairly well, and despite a slight inferiority in his position he might have obtained a draw had he played pawn to queen’s knight three on his 23rd move, which meant the exchange of his only well placed piece. The move he elected to make permitted me to form an accurately calculated combination which terminated in the decisive sacrifice of a piece, the gain of a pawn and an irresistible pressure of all white pieces. ‘WIESBADEN, Sept. 17 – The sixth game of my championship match with E.D. Bogoljubow resulted in a victory for the challenger, made the honors even again in the championship, and once more the cause of my losing is to be found in my choice of an unfortunate variation as the player of the black pieces. This time, however, the defeat was not due to an unsound development of pieces as was the case in the fourth and fifth games, but because a tactical “joker” was overlooked in the course of working out a somewhat complicated variation. On the 15th [sic] move, pawn to queen’s knight three, the player of the black pieces overlooked the reinforced counter-move employed in the chief variation which was played on this occasion – that is, after pawn to king’s four on 11th move, knight to king’s sixth cannot be played because of queen to queen’s three on the 12th move. After the retreat of knight to king’s two and the enforced exchange of queens which followed a few moves later, a position resulted which, in view of the existing general weakness of the entire queen’s wing, could not be defended against by accurate play. Yet I have the impression that Bogoljubow’s play from then on, although well carried out, nevertheless lacked “absolute exactness” for on the 18th [sic] move it was possible for me, by playing rook to queen’s square and only then knight to bishop’s square, to make it difficult for him to find the path to win. After this lapse, which is further indication that as yet I have not been able to get into my real stride in this match, Black had only a few harmless tactical sorties at his disposal, and finally he had to yield to the inevitable. The following variation may be noted: 47th move, knight to knight’s 5, rook to knight’s 5, 48th, pawn to rook’s 5, knight to bishop’s four mate. ‘WIESBADEN, Sept. 19 – The seventh game of my match with E.D. Bogoljubow again produced a decisive result – the fourth in succession. Even the most confirmed opponent of the contention that the game of chess is threatened with “death through draws” could not have hoped for such a development in the progress of this match. The more so as the game just decided did not hinge on the victory in the endgame as was the case in the three previous ones. It was a battle full of fire and mutual determination to win. It was carried on along strictly tactical lines throughout. The battle began when Bogoljubow, apparently dissatisfied with his previous Slavish defense of the Queen’s Gambit, this time elected to play the King’s Indian development, which enabled him to draw his game with José R. Capablanca in the recent Carlsbad tournament. On my fourth move, by playing a pawn to queen’s five I might have prevented the double advance of his queen’s pawn, a stratagem which Rubinstein employed in the Baden-Baden tournament of 1925. However, I preferred to allow the development in the centre of the board in order to have a more free hand later for manoeuvring by offering my queen’s bishop’s pawn sacrifice, which enabled me to collect a menacing formation of pawns in the centre. Perhaps the pressure of the white pieces might have been made more promising through a retreat of the knight to king’s bishop three on the 11th move. Because the move of the pawn to the bishop’s five, which suggested interesting complications, enabled Bogoljubow by playing his rook to the queen’s square on his 15th move to evade every possible immediate danger. In that case the game might have ended in a draw, if on the 17th move he had played the variation leading to an exchange of queens: Queen to bishop six; 18th queen to queen’s knight’s three, bishop takes queen’s pawn; 19th queen takes queen, [sic – add 19th ... bishop takes queen] 20th queen’s rook to bishop’s square and so forth. Apparently overestimating his position, however, he courted a complicated tactical continuation which, while it netted him a pawn in centre, exposed him to a kingside attack which was difficult to counter. In return for the exchange which he lost on the 20th move as a result of this attack, he temporarily won three pawns which, however, partially weakened him because they doubled and which, because of the attack carried on by the white queen, could only be defended with difficulty. The rest of the game proceeded with a program in which White was threatening a checkmate and was able to force an exchange of queens and virtually capture all of the opponent’s pawns. ‘WIESBADEN, Sept. 21 – The eighth and last game of the first series of tests in the world’s chess championship to be played at Wiesbaden proved to be a sharp and lively contest. As the player of the black pieces, I, this time, decided in favor of an immediate development of my queen’s bishop, but achieved only a half satisfactory result inasmuch as the pawn formation adopted in the centre by E.D. Bogoljubow, the challenger for my title, in the fourth and sixth games – P-KB3 and P-K4 – again seemed to serve his purpose. Indeed, the preponderance of White in the centre threatened to become so menacing that I decided, for the time being, to dispense with castling, which would have exposed my king to direct attack. I therefore initiated a demonstration on the queen’s wing, beginning with P-B4. In my opinion Bogoljubow should have countered this sortie with P-K5, which would have netted him a promising game. His move, B-Kt2, was a bit passive and as a result he soon was confronted with grave decisions. In order to prevent Black’s attempt to gain elbow room, PxP PxP P-K4 etc., he elected to play, on his 13th move, P-KB4, which immediately changed the entire constellation on the centre of the board. His move enabled Black to initiate an interesting king-side attack by advancing his rook’s pawn. Perhaps White might have withstood this attack a bit longer if he had played bishop to queen’s bishop’s square on his 17th move, whereupon Black probably would not have castled on the queen’s side, which otherwise suggested a safe undertaking. After Q-K4 [sic – Q-Kt4] on his 17th move, he only had a choice between several evils during the remainder of the game. The score now is four to two, a result which was reached in my match with José R. Capablanca only after the 21st game. If the present championship match also would call for only six victories one might possibly count on a relatively early termination, but it requires the absolute majority of 30 games, that is 15½ points, counting drawns [sic]. It may therefore be assumed that only about one-third of the match thus far has been carried out. Note: These texts were presented in C.N.s 1365, 1420, 1451, 1485 and 1511.